The second most popular herb for hormonal acne treatment used for excess androgens (testosterone hormones). Saw Palmetto is a member of the palm family and is used to decrease inflammation. Saw palmetto has also been found to decrease the uptake of testosterone in the body and may also impair the conversion of testosterone to dihydrotestosterone. These effects are likely attributed to natural anti-androgenic effects, which block the actions of testosterone in the body. This, in turn, may help prevent hirsutism or excessive hairiness in women with PCOS. It also helps thinning hair grow back and reduces acne breakouts. While Saw Palmetto is primarily marketed towards men, it can be used by females as well! For example, Saw Palmetto can be used as a natural replacement for Spironolactone when prescribed for acne because it is a natural androgen reducer. 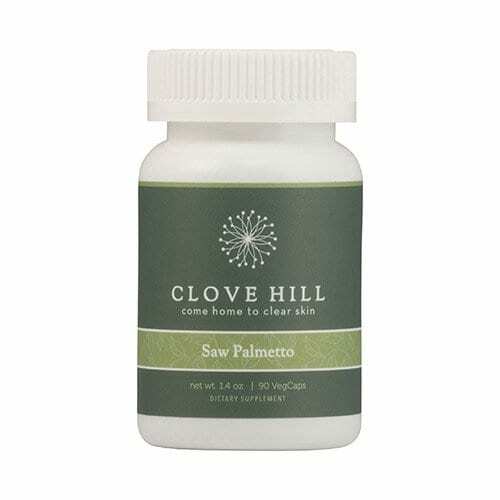 To improve hormonal acne or other hormonal issues we recommend 700-800 mg of Saw Palmetto for at least 3-6 months.